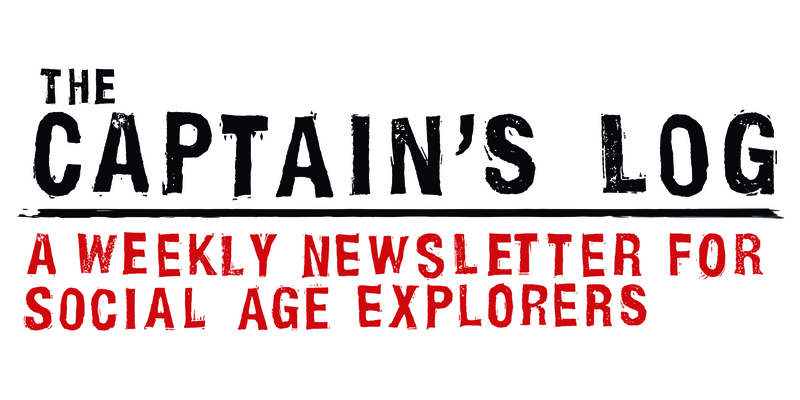 For the last year or so, i’ve been writing an Explorer newsletter every Friday (that’s why there’s no blog published fridays!). ‘The Captain’s Log’ has given me an opportunity to explore a different type of writing: it’s slightly longer form, and has a regular structure, including a space to comment on current affairs, all within the context of the Social Age. I’ve recorded various podcasts before, and have typically found them a very engaged, and engaging, format, but have never settled on a regular style or voice for them. It can also be a challenge fitting them into my workflow when travelling, but in July i’m going to start a new experiment, a weekly podcast aimed at my Explorer community, those people with an interest in, and curiosity about, the Social Age. My initial thinking was to run a podcast alongside the Captain’s Log newsletter, building out the topics that i cover there, but i’ve decided to prototype something slightly different instead. 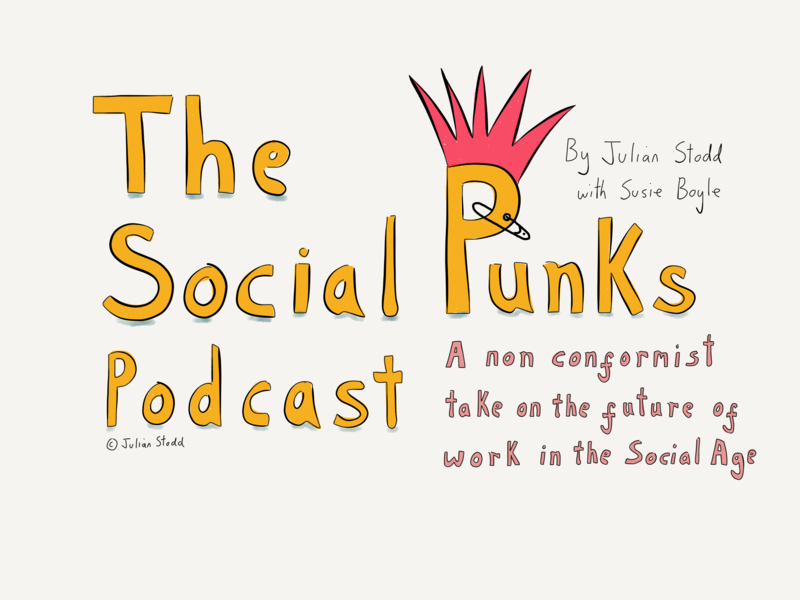 I think it’s a good discipline to flex your storytelling muscles, to explore different styles of writing (and thinking), and hence ‘The Social Punks’ podcast is where i will start. The Social Punks podcast will be a themed series, exploring cultural phenomena, and social movement, all within the context of the Social Age, but we shall try to bring a punk perspective! There are two things in my own recent experience that have informed this: firstly, my ongoing conversations with Susie, my most punk rock friend, and secondly, the stories i have been reading from the ageing punks, now rationalising how to be both punk, and parent, non conformist, but settled. There is something in these stories that is of value: the erosion of an old world order, the overthrow of authority, but also the emergence of a movement. Punk may appear as destruction, but can equally be constructive. Let me be clear: i am no expert on punk, but i think that may be the point. Punk is almost inherently an oppositional power, individually experienced, and less one guiding principle, than a (very) loosely defined ethos. You may disagree: that is almost the point. The problem with order is that, when you tear one down, another will emerge. If punk was about tearing down the old, what is the new? If the old world was one of structural power, and institutional order, what is the new? If the old world was industrial, what is the order of the new, social, one? Perhaps, in all of this, we can learn from the punk ethos, as we determine our new social one? The Social Punks podcast will be one thread in the exploration of this space. But it’s an experiment. We will record six editions, a first series, and then pause for breath. Another lesson from punk: sometimes brevity is salvation. My aim is to get the first of these out next week, and to be unafraid to vary the tone of voice and style throughout all six, to find our way, or to find that there is no way. Either outcome will work for me. As ever, the key barrier to creativity is often the fear of judgement or failure: circumnavigate that fear, and the only barrier to change is your own lethargy. This entry was posted in Podcast and tagged Leadership, Podcast, Punk, Social Age, Social Leadership, The Social Punk. Bookmark the permalink.